And Araby may find something not just to live for, but to fight for—no matter what it costs her . The world is under attack from within and society is separated into those who are infected, and those who are not. Araby knows first hand what happens to those who have the contagion, she has lived the same nightmare for three years. Araby's father is a scientist under the control of the Prince, who rules the land with an iron fist. The inventor of plague resistant masks for the rich and powerful in society, while the poor are denied such luxuries. Araby finds peace within the Debauchery club, with the Prince's niece. The only way to escape is through her next high. When a drug laced drink leaves her unconscious and alone, the handsome young host at the club ensures that Araby lives to see another day. Will has enough on his plate already, caring for two younger siblings. Vying for Araby's affections is the Prince's nephew Elliot. Elliot is somewhat of a freedom fighter, and enlists the help of Araby, to gain access to her father. Araby finds herself drawn to Will, with his tough exterior and gentle nature, while playing the part of fiancee on Elliot's arm. Mass rioting is destroying any hope of a new world. The reverent is preaching hateful religion in order to gain control, and he isn't working alone. A new plague is striking the population down, instant death, and it seems face masks are no match for the new bacterial warfare. This is officially the first 'Steam Punk' genre book I've read and I thoroughly enjoyed it. 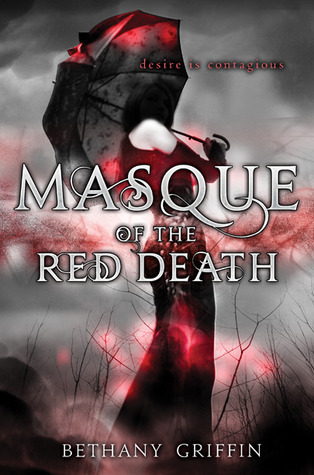 This is book is based on Edgar Allen Poe's book of the same name, The Masque of the Red Death, one I have not read I may add. But the world created by Bethany Griffin is magically. Elaborate costumes, masks, extraordinary transportation, I felt as though it was reading a modern dystopian historical novel and I was enthralled.